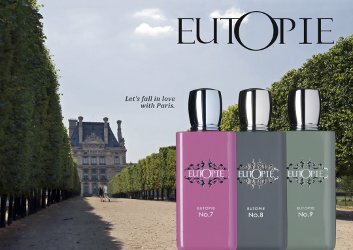 French niche line Eutopie has launched Eutopie No. 7, No. 8 and No. 9, three new fragrances inspired by France. Eutopie No. 7 ~ A green fruity spicy floral developed by perfumer Thomas Fontaine. "Elodie Pollet has dedicated the fragrance No. 7 to a very historic place: Versailles, where she invites us to take a stroll through the spectacular gardens of the Palace of Versailles. Set aside from the main attractions and located east of the Swiss Ornamental Lake, we find the Renaissance inspired Potager du Roi, the Kitchen Garden of the King. In those days, the garden‘s delicacies such as blackcurrant, peaches, strawberries and many other fruits and vegetables adorned the king’s dining table." With marigold, black currant, galbanum, pink pepper, freesia, water jasmine, mimosa, iris, cedar, white musk, peach and amber. Eutopie No. 8 ~ A green powdery floral developed by perfumer Thomas Fontaine. "Elodie Pollet envisioned a walk through a charming Parisian park, such as the Parc Monceau, which was opened in 1769 by Louis-Philippe II, Joseph de Bourbon, Duke of Orléans. Over a hundred years later, several paintings by impressionist painter Claude Monet immortalized this green haven in the midst of the French capital. [...] Eutopie’s No. 8 presents itself like an impressionist painting olfactorily swathed in highly atmospheric light. It captures the liveliness of a classic perfume but then, to a certain extent, portrays the green in a very impressionistic style." With galbanum, bergamot, green lemon, neroli, mastic, mint, incense, cedar, white musk and amber. Eutopie No. 9 ~ A woody aromatic fougère developed by perfumer Sonia Constant. "Elodie Pollet’s creation No. 9, surprises with its choice of protagonist, as none other than the savoury note of sage takes center stage in this composition. Sage is not only regarded as a valuable medicinal herb but chefs and gourmets also prize the hearty aroma of this plant that belongs to the mint family. When the essential oil from sage leaves is extracted by steam distillation, it develops a characteristic fragrance: fresh, camphorous, spicy and herbaceous, slightly reminiscent of lavender, with a green and bitter undertone." With bergamot, nutmeg, sage, violet leaves, jasmine, vetiver, moss, musk and cedar. Eutopie No. 7, No. 8 and No. 9 are €155 each for 100 ml Eau de Parfum. I just wish they would stop all these new niche lines. Is anyone going to buy these? The notes of No. 9 are vaguely interesting, but they all seem to have nothing to do with my life….and those bottles are totally unappealing. Guess I am not who they are marketing toward. I don’t like the packaging either. They might be great though!